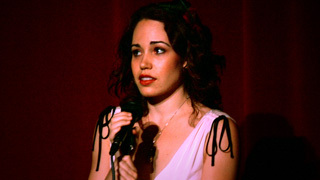 Known for the depth of character brought to each piece, Jillian's emotional performances are matched only by her sound. From her “melted chocolate voice” perfectly suited to jazz and blues, to her clear broadway-belt, to the bit of edge and an almost three octave range useful for pop and rock, her chameleon voice has served her well in musical venture after musical venture. Her parents’ claim that she began to sing before she could speak is no exaggeration. Performing for family and neighbors, by the age of 13 she graduated to touring all over Europe. In high school, she found a home in the top choir at Long Beach Polytechnic, a 4-time Grammy and 2-time Golden Signature Grammy Award winning school, earning the title “Most Valuable Member” by then-choral director. Whilst there, she soloed with her jazz choir in the North Sea Jazz Festival in The Netherlands, one of only two youth choirs to perform amongst the likes of Diane Reeves and The Roots, finally ending her high school career by earning second place in the solo jazz competition at the renowned Fullerton Jazz Festival. At Sarah Lawrence College she similarly swept through the school, cast in musical after musical, while continuing to study jazz. During her year abroad in Florence she auditioned for and was accepted into the official Corro del Duomo, and kept her chops up at a local jazz club before finishing school and moving out to Los Angeles. There, Jillian co-wrote and starred in the deliciously reviewed “Swingin’ Sisters Cabaret” that ran for 6 months at Macha Theatre and Mbar. In January 2010, Jillian auditioned for and wow’d the judges in Los Angeles’ “So You Think You Can Sing,” progressing every week until the finale, where her rendition of “Minnie the Moocher” knocked the audience silly. Jillian can be seen in musicals and gigs around the city including the world-famous House of Blues on Sunset and the new Rolling Stone's Club. She is furiously at work on a new one-woman show, and just finished her demo.